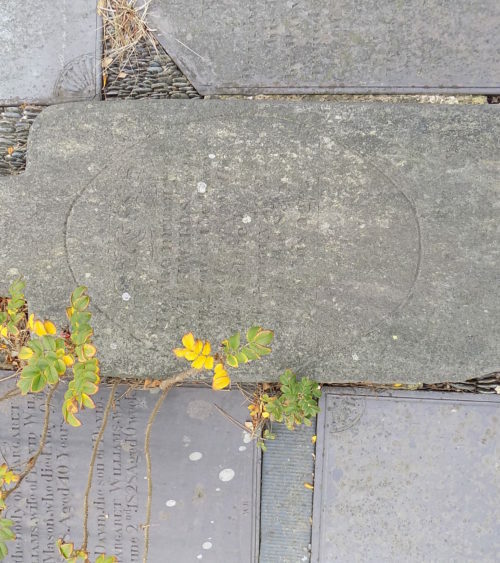 In 1703 a grave was being prepared for 89-year-old John Gape, a rich tanner and former mayor of St Albans. He had asked to be buried in his parish church, St Albans Abbey, in the Saint’s chapel, which had been used as the consistory court since the Reformation. As the men started to dig, an underground burial chamber was uncovered. At the bottom of a narrow flight of stairs lay a large coffin and when the lid was removed a male corpse was revealed, lying in a bath of aromatic liquid. The body, visible in the murky depths was in an astonishing state of preservation. The discovery caused a sensation as clergy and congregation flocked to view the corpse and pronounce upon its significance. News of it appeared in national journals. Although it was the Age of Reason, most believed that the preservation of the body was surely due to its proximity to the long-gone relics of St Alban. A blessed miracle! The fact that the body was later identified by antiquarians as a royal prince, that of Humphrey Duke of Gloucester perhaps made it more attractive and certainly did not deter women from dipping their fingers in the magic liquid and applying it to their faces to ward off wrinkles. The burial chamber walls are covered in their names. Soon the sexton was doing a roaring trade selling thimbles-full of the magic potion which surely had wonderful medicinal properties. Some of the money provided a tidy income to parish funds and physicians took away phials of the liquid for scientific experimentation. It was in fact alcohol laced with embalming spices. Local inns benefited from this grisly tourist attraction and cheap brandy was offered discreetly to the Parish Clerk for topping-up purposes, to keep the wheels of commerce turning. There was still some liquid left in 1752. It provided a national tourist attraction and David Garrick wrote a ballad about his visit, deploring the waste of fine alcohol on a corpse. He determined to drink sufficient booze during his lifetime to preserve his body from within. Eventually the liquid had to be seen to be disappearing, and the exposed corpse began to decay. Visitors then pulled bits of poor Humphrey’s nails and hair away and today only half of his bones remain. It was not until the discovery of the fragments of the shrine of St Alban were discovered in 1872, providing a much more elevating spiritual attraction, that the trap door was finally closed on Duke Humphrey. He doesn’t haunt us. As a scholar, we hope that he can understand the yearning of women for eternal youth and everyone longs for magic medicines to cure all ills. Who was this royal prince and why was he buried at St Albans Abbey in the most prestigious place? Humphrey Duke of Gloucester (1391-1447) was the youngest of the four sons of King Henry IV, Bolingbroke. A natural scholar, it was his misfortune to be born during the Hundred Years War with France. After the untimely death of his brother King Henry V, leaving his heir just a few months old, his brothers John of Bedford and Humphrey of Gloucester were appointed respectively regents in France and England. Temperamentally John was a good soldier, calm and brave. Humphrey was brave but too hot-headed for diplomacy. Henry V was buried at Westminster Abbey with a silver-covered effigy on a splendid tomb chest in a chantry with a chapel above. This impressive design was repeated at Winchester for Henry’s and Humphrey’s uncle, Cardinal Beaufort (1377-1447) and for Humphrey at St Albans Abbey. Both chapels are far less grand as the spaces claimed for the monuments was smaller than at Westminster, and although there appear to be upstairs chapels, there is in fact no access above at Winchester or St Albans. Humphrey was a great friend of the Abbot of St Albans, John of Wheathampstead. They met at university and St Alban became Humphrey’s favourite saint. He ordered and paid for his chantry and burial vault in 1442 at a cost of £434.6s.8d. and an annual expenditure of £142.13s.4d. was paid to the monks for masses for the Duke and his soul, and for candles to be lit daily on the now-absent altar which would have been placed at the east end of the chantry. 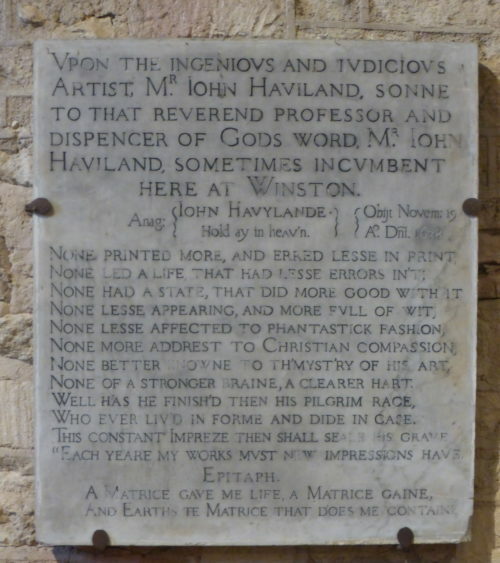 (This was financed by Humphrey’s gift to the Abbey of the income of the priory of Pembroke, which he owned. He also left £60 a year to the monastery kitchen, a gift which must have greatly pleased the monks). 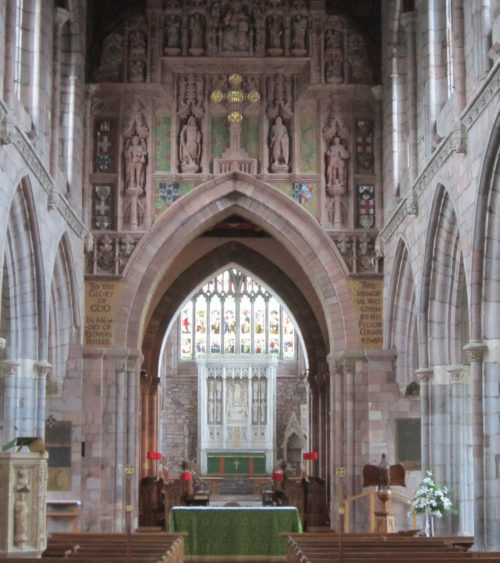 There was never any provision for an effigy, probably because Humphrey was a humanist and the Gardens of Adonis, little vases of flowers, appear as a decorative motif all around the chantry. 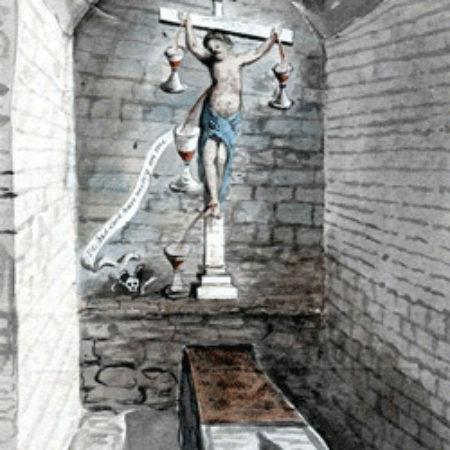 In the burial chamber, a painting of Christ crucified presents Him as the Mystic Grape with chalices collecting water and blood from His wounds for the two main sacraments of baptism and Eucharist. The painting, now much faded, was well-recorded in 18th-century antiquarian pictures. The chantry is in the most prestigious position on the south side of the Saint’s shrine, a place that could only be claimed by royalty. Residual paint in the recesses of the carving shows that it was colour co-ordinated blue and red with recesses in the Saint’s shrine. The Duke’s shield of arms, carved with great delicacy, figures prominently and obsessively, perhaps because his father usurped the throne. The number of ducal caps and shields is excessive but decorative. The miniature fan vaulting with open pendants is very fine. There are 17 niches on each side of the canopy, those facing the Shrine now empty of statues, no doubt because they contained saints, which would have been destroyed when King Edward VI’s edict of 1547 commanded that all religious images must be removed from wall and window. On the south side 17 kings occupy the niches, and trying to identify them is a popular local sport. Had there been only 15 it could be said that they represented English kings from the Conqueror to Humphrey’s day. One of the kings holds a castle, while all the others once held sceptres (symbol of authority) which have been broken off or removed. This vandalism can have been no easy task, and was probably the work of Cromwellian supporters. The message is clear: the authority of kings can be destroyed. A statue damaged in a particular way says more than an empty niche. These 17 kings are almost all that remains of the Abbey’s medieval carving which was destroyed by iconoclasts. Unfortunately the little kings were not carved by the skilled sculptors who made the chantry. They are squat and gnomic, like parodies of playing card figures. On the south side of the chantry a contemporary iron grille of fine quality allowed pilgrims full view of the Shrine of At Alban. Humphrey died in suspicious circumstances in Bury St Edmunds, where he had been summoned to meet the Duke of Suffolk, who was in thrall to the Queen, Margaret of Anjou. Humphrey, who had disapproved of King Henry VI’s marriage to this devious woman, had watched these twins of mischief manipulating the simple-minded King to their advantage. Humphrey was a thorn in their flesh, and would inherit the throne if Henry and his son died. On 18th February 1447 he arrived at Bury St Edmunds with 18 supporters. The next day he was arrested and his personal servants were taken from him – a shocking event for a royal prince. That night he fell into a coma and died three days later, aged 56. 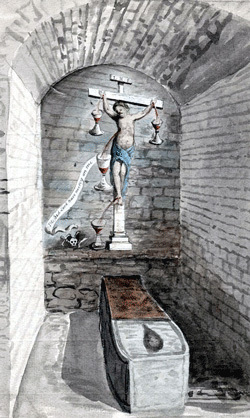 His corpse was displayed so that all could see no marks of violence on it. It was then disembowelled and encased in a double coffin and a torchlight procession of his followers slowly made its way to St Albans where he was buried will less-than-royal ceremony, but those present were genuine mourners. Was Humphrey murdered, or did he die of natural causes? The Abbot clearly states that his sickness was probably brought on by the shock of his arrest and separation from his supporters and personal servants. Suspicion fell on Somerset and the Queen, and indeed their immediate seizure of his property, on the day that he died, points to assassination. Humphrey’s greatest legacy was his influence on scholarship in England. His early interest an Humanism, the New Learning, was later espoused by Erasmus and Moore. He kept a house full of scholars busy translating the classics. They understood Greek, and indeed Humphrey himself could read from Plato and Aristotle. And by calling his daughter Antigone, he demonstrated not only his admiration for Sophocles, but also for those who valued spiritual laws above those of the state. © Jane Kelsall, Cathedral and Abbey Church of St Alban.